Slipping in for a last minute Dynamic Duos! I just love these colours together for the holidays! I used my new Wink of Stella Brush to add a bit of glitter to the bird's hat. After loading the brush I learned that when they say in the instructions to "gently squeeze" and it doesn't seem to be coming out, not to keep "gently squeezing"--ha ha. It came out all right. The effect is really pretty, I don't know how we have managed in the past without these brush pens. 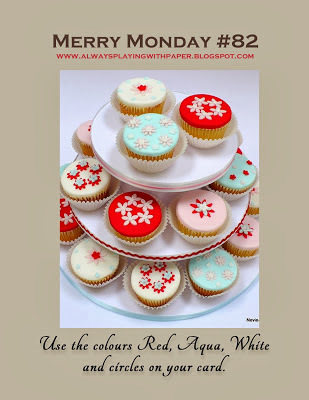 I am also submitting this card for this week's Merry Monday Challenge #82 to use red, aqua and white on your Christmas creations and the Simon Says Wednesday Challenge to keep it Clean & Simple! Ohhh pretty! Love the sparkle! This is adorable...and of course, I am way behind the trends and have only just heard of Stella Wink...and haven't seen them at all! But your birdie sure is cute! Oh my - another delightfully adorable card! Your talents and creativity are without limit! So day-brightening and inspiring to visit here! Oh my - yet another adorable card! Your talent and creativity seem without limit! A visit here is always guaranteed to brighten my day and spark ideas! Thank you! Love the little blue bird. This is adorable!!! Cute Cute Cute!!! I've never heard of the pens, might have to check them out! This is gorgeous Tracey. You leave just the perfect amount of white space. This is so perfect for Merry Mondays...love that lil bird! Beautiful! This is both simple and bold, that red circle really gives it a WOW pop! Love this! What a sweet little card! Love the addition of the Wink of Stella pen (mine arrived this week, too; SSS was out of them for awhile!). Perfect amounts of the challenge colours on a pristine snow-white base! 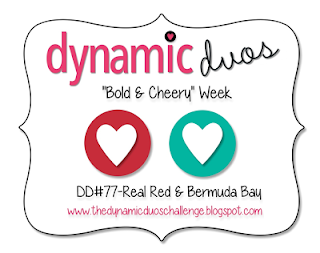 Thanks for coming back to play with the Dynamic Duos this week. So cute Tracey, and the first thing I was going to tell you is Merry Mondays. You already knew. So adorable! I really need to play along with this color combo but I'm not sure that is going to happen before Saturday! I am smiling about the glitter...I'm not very patient! I'd do the same thing! Wow total perfection! So clean and crisp.....and perfectly colored! Oh this could not be any cuter Tracey!! 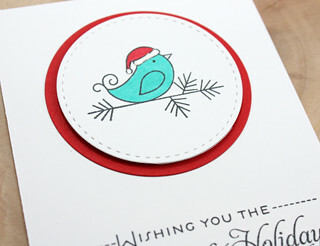 Love that adorable little bird and the stitched mat is fabulous!! So sweet and CAS. Love it. So cute!! I loveeeeee the bird!!!! Totally adorable, Tracey! Love that little bird! Hi Tracey! So cute and colors are perfect. Gotta find that brush pen. Such a cute and fun card. Love that bird. Fabulous look to this card, Tracey! I keep hearing about that glitter brush & wish I had one! Some of my favorite colors for Christmas, too, Tracey! Thanks so much for sharing your adorable card with us at the Simon Says Stamp Wednesday Challenge! Oh my gosh! Tracey, this little bird is adorable! 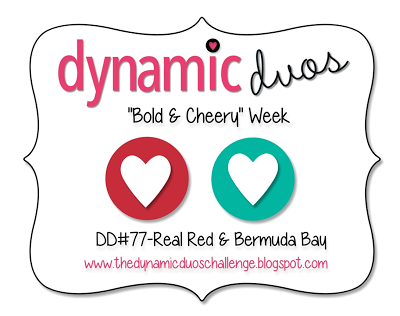 Thanks for joining Dynamic Duos! Do we ever tire of our friends telling us how awesome our cards are? NO!! 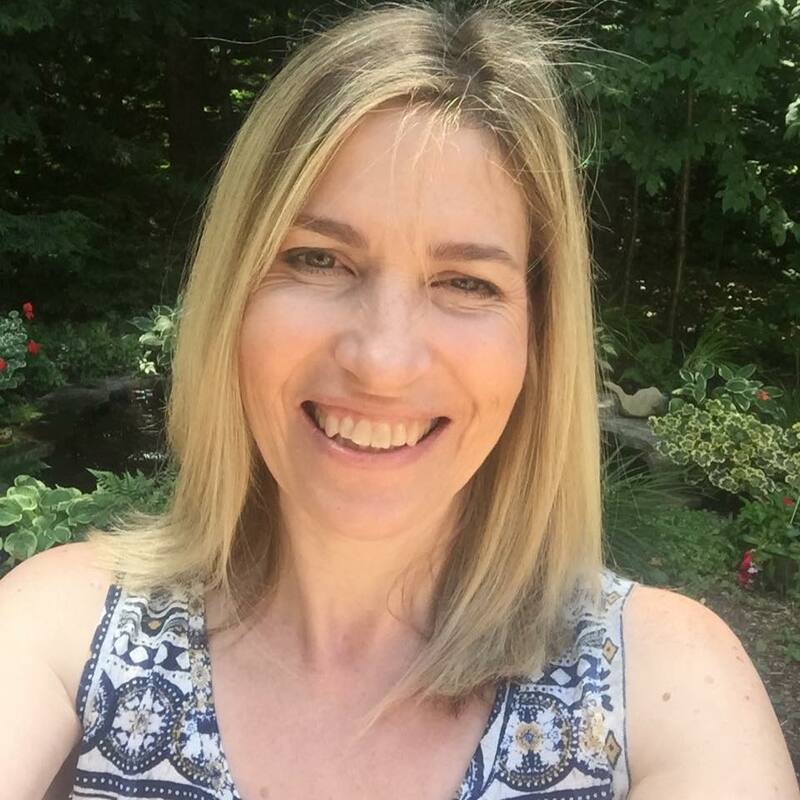 Another great one, Tracey! You are too funny! I need to look for one of those pens...I need anything you think I can't live without! I'm still trying to figure out what that Wink of Stella is. LOL, I'm so far behind! Love this sweet little bird and the stitched circle! Such a happy card! Thanks for sharing with us at Merry Monday! Hope you've had a special week! what a perfect card for the two challenges Tracey! Such a sweet tweet! Love your sweet little bird just too cute sitting there all decked out for Christmas. Love the bit of sparkle too, so festive. I learned the hard way that they aren't kidding about the "gently" squeeze part when a large blob of glittered ink ended up on my craft desk! I love your cute bird - perfect for the colors! too cute and love that big sentiment.. that bird is adorable.. So sweet! Just perfect in every way! A beautiful and perfect Christmas card. Just gorgeous! 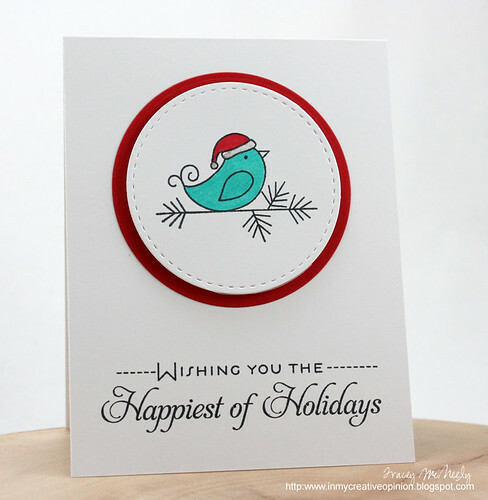 Your birdie card evokes such a beautiful, snowy feeling. Love it, Tracey! Amazing, lovely, clean and crisp...!!! Adorable card Tracey, your little bird is so cute. I ordered a clear Wink of Stella the other day and can't wait to try it. Thank you for playing along with Merry Monday. Hooray, Tracey! So happy you played and I love your sweet card!! Thank you for joining us at Merry Monday! So sweet! I just love these colors for Christmas! Cute as can be! I just love this palette for winter, and the overall design is such a great take on the challenges! Hope all is well with you. Love your card...so crisp and clean looking and cute too.